Next isn't somewhere I usually shop but when I was passing through the other day I spotted these and promptly tried them on. They're one of those shoes that look so much better on, the picture doesn't seem to do them justice. I'm undecided as to weather to get them in the black (sensible option) or cobalt (my favourite colour). Although I have to admit for just £30 there is a temptation to get both! I must admit I prefer more expensive option here although I have to check out Next cobalt ones - I also love this colour! I actually like the Next version better! 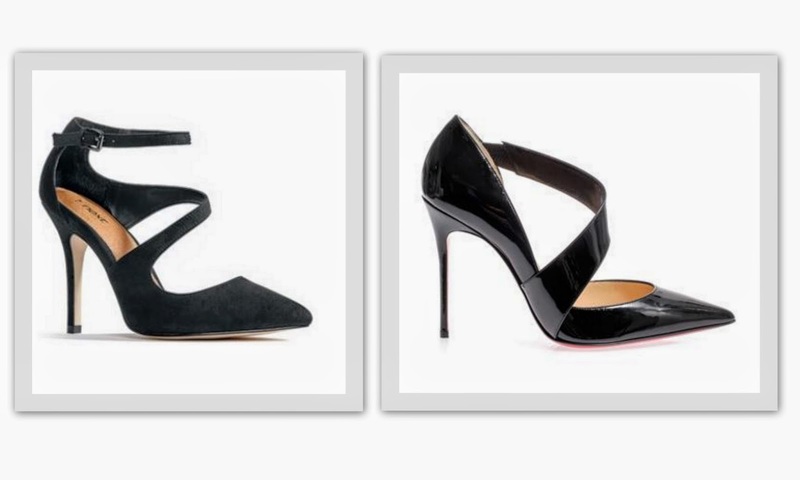 I like the ankle strap, and the heel is a tiny bit more substantial than the Louboutin heel. Also, as much as I love patent leather, it never feels as versatile as something a little more subtle. I have to say that with the low price tag, I would certainly be tempted to go with cobalt and black both. These are beautiful shoes, and they would make great staples in your wardrobe, I can see the style being flattering for years. What a great find! They do look very striking in the blue, definitely check them out! I went into Next to get them and they were sold out instore :( looks like I'll be ordering them online instead! I thought I should get the black ones too as they're the more sensible option but then I realised I have loads of black heels already so I think I'm going to get the Cobalt ones! Although if they're very comfortable and I wear them a lot I might get the black too! I think I do too! The ankle strap would definitely make them more comfortable to walk in too and I definitely have to agree with you on the patent thing, I have a few pairs of patent hells and I just don't wear them as much as my other ones. I'm certainly tempted to get both but I've decided to just get the cobalt for now and see how comfy they are! Then maybe go back for the black later and hope that they go into the sale!